This issue features nine articles in relation to fraud from 2012 . 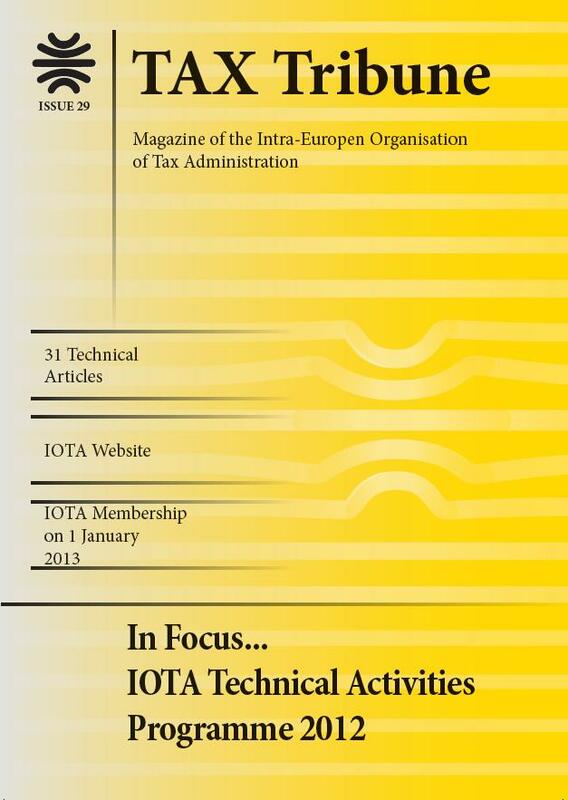 IOTA organised several Workshops, Case Study Workshops and Area Group Meetings with various fraud themes and most of the articles are based on the presentations of the participants from these meetings. From the Finish Grexel consultancy company Marko Lehtovaara and Markus Klimscheffskij explain how energy certificate markets work in Europe. The complex energy certificate trading systems need to be understood which is crucial to controlling the VAT linked to it. In this section François Trechot’s article introduces the reader to a special market, the electronic telecommunication services and VOIP services in France, which saw dramatic changes after the carbon credit fraud cases. The actions taken by France to combat this threat are explained in detail. Franck Benoit explains in his article which strategies are the most suitable to tackle tax fraud on the internet. Not only the technical aspects are discussed, but the specialised tools required. Fiscal Monitoring in Italy is explained by Valerio Rondoni and Gennaro Aulenta which is important to tackle tax fraud and capital outflow. The Italian case is supported by a description of the legislation issues and examples from the work of the tax administration. How the income yardstick can be used as an indirect method for estimating tax liabilities of individuals in Italy is explained by Maria Luisa Guermani. The Latvian Edgars Hercenbergs gives an in-depth analysis of a VAT fraud case. The article not only analysis the case, but gives an insight into the terminology used and a comparison of the different approaches available for tackling VAT fraud along with suggested solutions. The new measures to prevent and combat tax fraud in Spain are explained in the article by Alfredo Arranz Sainz and Marcos Alvarez Suso. The changes are new, as the new act came into power on the 31st of October 2012 but will already be of interest to other countries. You can read about the VAT risk selection processes in Spain described by Juan Ponz who examines the risk scoring and dynamic analysis. Norwegian fictitious invoicing and tackling the issues are documented by Bjørn Weider Moen. Guri E. Stange Lystad, Reino Nielsen, Alma Olofsdottir in their article explain the involvement of payment platforms in VAT fraud cases from the Nordic perspective. They also explain the history of alternative banking and how payment platforms facilitate VAT fraud. Electronic services are becoming more and more important in the life of tax administrations. They have a crucial role to play in maintaining contact with taxpayers, storing and analysing information and combating tax fraud. In this section Mikayel Pashayan has written an article about e-Governance in the Armenian Tax Administration. Nowadays complex e-Governance has already become a reality and its structure is explained in detail. In Belgium the tax administration are using complex data mining tools which are explained by By Dirk U. Potvin, a specialist in the field of data mining since 2004. The ever growing amount of virtual money is challenging the work of tax administrations. The Norwegians André Heggstad and Espen Norkyn provide an overview and a basic understanding of electronic money and virtual currency schemes to auditors and tax lawyers. David Whyte from the United Kingdom presents the work carried out during the IOTA Workshop in February 2012 on the Use of Forensic Tools and techniques to Combat Fraud. The article includes the collaborative work of computer forensic specialists, EDP auditors and a wide spectrum of countries with varying forensic and audit skills. Mutual assistance between countries in the field of taxation has become more and more important due to the ever growing globalisation of businesses. Mutual assistance is carried out on the basis of both bilateral and multilateral tax treaties often supported by the European Union or the OECD The Belgian Patrick De Mets explains the possible bottlenecks and positive effects of the European Union Directive 2010/24. He also explains the possible interactions with the domestic tax collection and recovery processes are. We can obtain the perspective of the European Commission on tax collection and recovery in the European Union thanks to Luk Vandenberghe. He writes in his article about the history of recovery, assistance and the ever growing need for mutual assistance. Individuals and firms can evade taxes by underreporting incomes, sales, or wealth; by overstating deductions, exemptions, or credits; or by failing to file appropriate tax returns. Tax administrations must take the necessary actions to ensure compliance with the tax laws. Compliance includes various measures including the providing the best possible information to taxpayers, improving taxpayer services, benchmarking their activities and making collection and recovery of debt more efficient. Grigori Davtyan from Armenia introduces a possible new solution whereby administrative requirements could be simplified in order to reduce the administrative burden for businesses as well as for tax administrations. Tax debt management in Azerbaijan is described by Ilkin Veliyev. He takes a special look at information technologies that make tax compliance easier and more cost effective. In Georgia in the last decade the taxation landscape has changed a lot, including legislation, organisational structure and compliance. Lily Begiashvili explains how they improved their compliance services to be able to change attitudes and to destroy the negative stereotypes linked to tax administration. The use of Industry Benchmarks in Germany is explained by Martin Zöller. This benchmarking activity is carried out between the federal state in a standard format. In Norway benchmarking between regions provided a positive experience. In Kjersti Pederesen’s article it is described how the project achieved better results and how the participating regions are now closer to the desired results than ever. OECD’s perspective on ensuring tax compliance is presented by Pascal Saint-Amans. . There is a perception that large multinational enterprises are increasingly adept at sheltering profits from taxation, eroding the tax base in countries which impose taxes and shifting profits to places where they are subject to low or no taxation. Addressing these challenges is important for all countries but it is particularly important for developing countries. Not only is an effective tax system necessary to ensure tax compliance but there is an ever growing need for international cooperation. Kaja Zalewska and Magdalena Leki prepared an article based on their voluntary compliance experiences in Poland. It describes what initiatives tax administrations can undertake to change taxpayers’ attitudes towards their tax obligations and create a long-term awareness of importance of paying taxes. The Portuguese experience of new trends in governance is set out by José António de Azevedo Pereira . This article may be of special interesting, as the Portuguese Tax Administration hopes to become the most innovative in Europe. Their goal is to become simpler, faster and less expensive, as well as offering a quicker and more effective response to taxpayer’s queries. The Serbian Tax Administration is improving its compliance management which is explained in detail by Aleksandar Dragojlović. This plan was undertaken by exploring new ways of working which could positively impact on compliance levels and taxpayer perceptions of the organization. Influencing taxpayer behaviour is a complicated task, and new findings suggest new approaches. Traditionally it has been thought that compliance can be achieved purely through the high risk of detection and sanctions for non-compliance. Lennart Wittberg from Sweden offers an insight into new findings from research that can be used for strengthening compliance in, for instance, the field of behavioral economics. Tax administration’s budgets haven’t been changed due to the financial crisis of the recent years. Therefore, the promotion of efficiency and effectiveness of Human Resources is more necessary than ever. Besides budget determination rules there is also the important issue of the size of the tax administration, a question on which theoretical prescriptions are available. In this section the first article is provided by Alakbar Mammadov about the Training strategy adopted by the Azerbaijan Tax Administration. In Azerbaijan there have been significant tax reforms in recent years. Parallel to these, there has been a need to increase the professional level of tax officers as well as to create a favourable tax environment and tax culture in the country. One important step in supporting these changes was the establishment of a new Training Centre. The first of the two Finnish articles in this section has been written by Juha Lindgren and Tiina-Liisa Huhtinen. It describes how tax administrations can achieve more with less. The Finnish Tax Administration has selected a process approach as their strategy in operations development. This is considered the way to ensure smooth operations through the whole process chain from customer to customer and to avoid sub-optimization between functions. For process development initiatives the principles of Lean management provide a strong background, and the changes have also had a strong influence for the employees. The measurement of the effects of training is a complex challenge. Merja Kujala and Sanna Alamäki wrote their article on how in Finland they have developed ways for doing this. They begin by explaining how their strategy has affected the training system and why it is vital to connect performance and training directly with each other. They continue by illustrating how, by whom and why they have measured the effects of training in the Finnish Tax Administration. They go on to describe what the effects are of how training support is organized in order to support effective training and what have been the changes and differences between the previous Tax Academy model and the current training support.